RETRO KIMMER'S BLOG: REMAINS OF BUTCHERED MAMMOTH UNEARTHED NEAR MY HOME! REMAINS OF BUTCHERED MAMMOTH UNEARTHED NEAR MY HOME! How exciting! 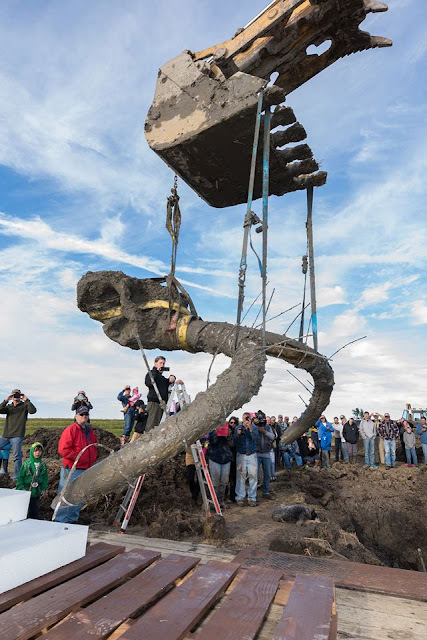 A farm owner just a few miles down the road from me was digging in a field and discovered the remains of an ancient Mammoth!! 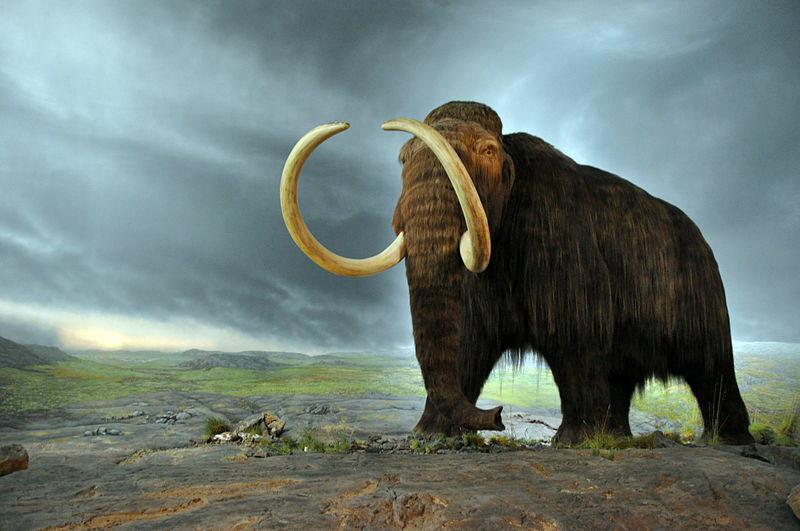 The woolly mammoth coexisted with early humans, who used its bones and tusks for making art, tools, and dwellings, and the species was also hunted for food. It disappeared from its mainland range at the end of the Pleistocene 10,000 years ago, most likely through climate change and consequent shrinkage of its habitat, hunting by humans, or a combination of the two. Isolated populations survived on St. Paul Island until 6,400 years ago and Wrangel Island until 4,000 years ago. 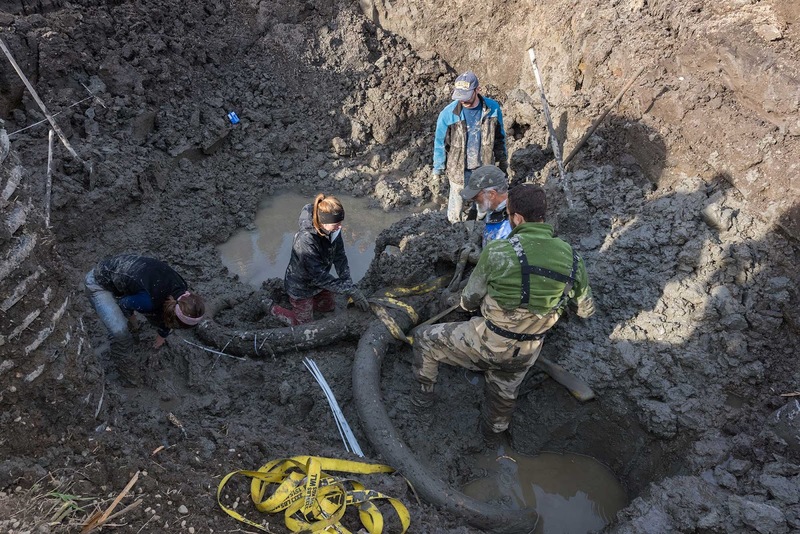 ANN ARBOR, MICHIGAN—About 20 percent of an adult male mammoth that lived between 11,700 and 15,000 years ago was excavated by a team from the University of Michigan from a farmer’s field in southern Michigan. The skull, tusks, numerous vertebrae and ribs, and parts of the pelvis and shoulder blades were recovered, along with a small stone flake that may have been used for cutting, and three basketball-sized boulders that may have been used to anchor the carcass pieces in a pond. “We think that humans were here and may have butchered and stashed the meat so that they could come back later for it,” paleontologist Daniel Fisher explained in a press release. In addition, the vertebrae were found arrayed in their correct anatomical sequence, and not scattered randomly as they would have been if the mammoth had died of natural causes. As Fisher said, it was as if someone had “chopped a big chunk out of the body and placed it in the pond for storage.” The team will look for cut marks on the bones and date them. To read more about who would have hunted mammoth 11,700 years ago, go to "America, in the Beginning."